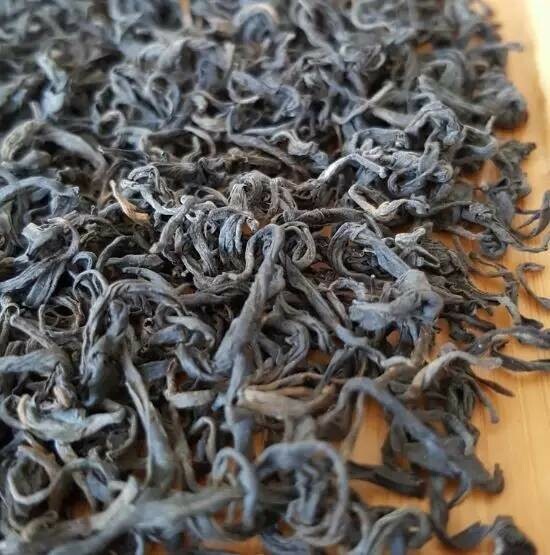 Liu Bao is one unique tea in the Dark Tea (Hei Cha黑茶) type with long history that reveals the unique minority tribe culture from the Bouxcuengh. Liu Bao is made from the Guanxi large-to-medium sized tea tree cultivar, the reason why it’s named to Liu Bao because it’s from Liu Bao country, Wuzhou, Guanxi province, China. The average altitude of the region is between 1000-1500 meters. 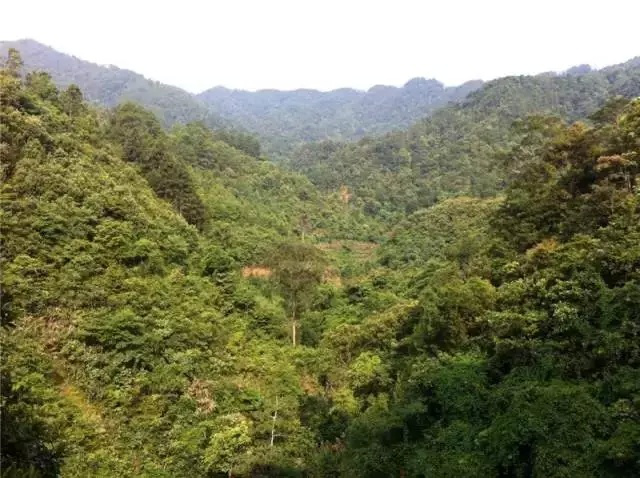 The unique high mountain ecological balanced environment provides Liu Bao an excellent growing conditions, i.e. the yearly average temperature is abt. 21℃; the yearly average rainfall is abt. 1500mm, direct sunshine time is short and the tea region is almost the whole year round surrounded by cloud. Liu Bao is made from the 1 bud with 2-3, sometimes 3-4 leaves. 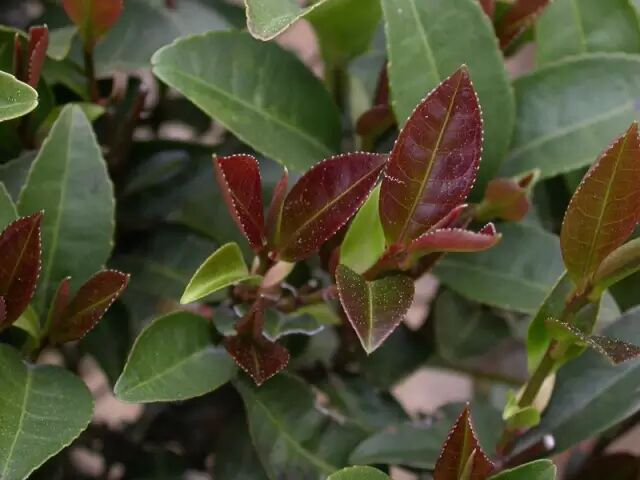 Once leaves were plucked, tea farmers must finish the production in the same day. Liu Bao is processed according to the sequence of Tea fixing -> Rolling -> Piling (fermentation) -> repeat rolling -> drying (roasting). How roasting method in the drying process is managed and the selection of woods are playing critical roles to the flavor and taste. Liu Bao contains very rich Vitamin C, Polyphonel and Nicotinic Acid compounds. According to various researches, Liu Bao can aid to reduce fat, lower blood pressure, stimulate blood circulation and enhance the immunity system: 1) help digestion 2) reduce blood sugar 3) anti-aging 4) anti-bacteria. The taste of Liu Bao is very gentle to stomach. But it is like for all tea, consume too much and too strong tea might cause headache syndrome as tea drunk. Therefore we highly suggest to limit the daily consumption to 3g-5g. It’s not tea causes the health problems, it is because people don’t know how to consume correctly. Those who have sleeping problem should certainly pay extra attention on how to brew and how much to drink a day. Cast iron tea pot is not to be used to boil or brew tea. When the taste is getting weak, then can consider to increase the soaking time. There is a very mild and distance woody note as from Camphor with the blend of Areca Catechu or kind of mint. After the rinsing, besides the woody note and the coolness from the Areca Catechu, also have notes of sea wood and peat moss. The unique character of Liu Bao is it does not have very impulsive and strong taste. It’s very easy and pleasant to drink because of its dried sweetness. The soft and calm taste allow us to sense the depth of wisdom of acceptance and tolerance in the “Wood Element” from the Five Elements. 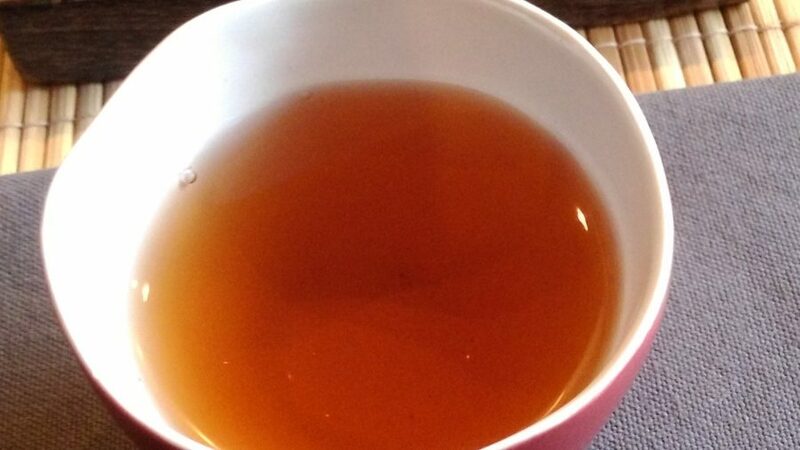 Because the color of tea is more rich redish Amber to Brownish red instead of nearly black dark brown color. Because there is a separate tea category as Black tea (Hei Cha) in Chinese. Since the name of black tea has already been used for Red Tea (Hong Cha) in English, so the Chinese Hei Cha can also be named and known as Dark Tea. 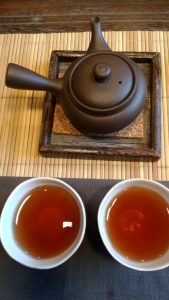 Why dark tea is known as black tea in Chinese? It’s simple, as you can see that the color of dried leaves is almost like black. It does not nice look shape or fine aroma like what we can notice from green tea, oolong or black tea (red tea); but you will be amazed by its flavour and taste. 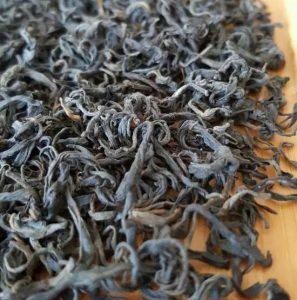 All Black Tea (Dark tea) share a same unique process, that’s post-fermentation, tea can be stored for almost forever (the taste and value increased by its natural aging process) and the flavour and taste can be transformed amazingly, fine and gentle. The biggest difference of these traditional Dark Tea (Hei Cha) from Puerh is, in Puerh it is further divided in Raw and Ripped, but in other Hei Cha, there is only one, the full and post-fermented quality; some are compressed into cake or brick, and some not. For example Liu Bao is in loose package. Vision : very dried dark almost black color. The tea color is kind of mixture of organe with copper brown; clarity and rich. Taste: Mild, smooth with a notion of sweetness, easy to drink. Due to the post fermentation, so there is no very strong after taste punch up in the mouth except the taste of sweetness and smoothness. Drinking : Don’t hurry up to drink the tea from your cup especially with the dark tea (black tea), the flavour is getting even more finer when the temperature drops to about 80-85 Celsius. Liu Bao Cha, also known as LiuPao Cha, is another unique Dark tea (Hei Cha in Chinese means Black Tea), a speciality from Liu Bao, Chang Wu Xian in the autonomous region by the minority Zhuang tribe, it is another drinkable antique same as Puerh tea from Yunnan. Liu Bao Cha is made from fresh leaves from the mid-sized leaves of Camelliasinensis (L.)O.Kuntze, it is picked either 1 bud with 1 leaf or 1 bud with 3-4 leaves, the picking time is in March to November. It has long history that can trace way back to 1500 to 2000 years in Chinese history. It is known by its unique betel nuts flavour and the noticeable special characters of rich red color, with earthy flavour, with mellow but strengthened astringent after taste; regardless is Sheng (Raw) or Shou (Ripped), the color of leaves after being brewed is all in shinning reddish or dark brown. Even though the caffeine in dark tea is higher than found in green, white or black tea, but the good news with the aging transformation in the post-fermentation process, the content of caffeine is weakened. Liu Bao Cha has benefits to those who have problem with hypertension, hyperlipidemia (high blood viscosity, high cholesterol and high triglycerides), high blood sugar (diaetes), high uric acid that cause gout psychosis crowd. It has effects to ease heat and dampness, laxative flooding dysentery, cellulite blood pressure, and has hypoglycemi sedative effects. Liu Bao Cha has been appreciated by many Chinese and Chinese migrants live in South East Asia through the Ocean Silkroad in the last Qing Dynasty. Using very warm water, the higher temperature the better. Wash the tea leaves twice, as quick as you can.